George, has not been to happy with us since we have sentenced him to his love nest. The hens on the outside aren’t to happy either. They have been trying hard to figure a way to get to George. 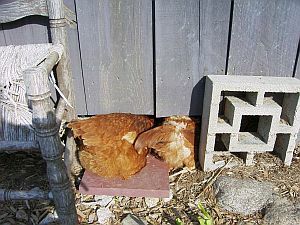 This morning I found two or three chickens digging under the barn. They were looking longingly for a way in to their honey. It must be great to have that kind of magnetism. Imagine having that kind of luck with the chicks.